(Nanowerk News) The little-known cloud of cosmic gas and dust called Gum 15 is the birthplace and home of hot young stars. Beautiful and deadly, these stars mould the appearance of their mother nebula and, as they progress into adulthood, will eventually also be the death of her. 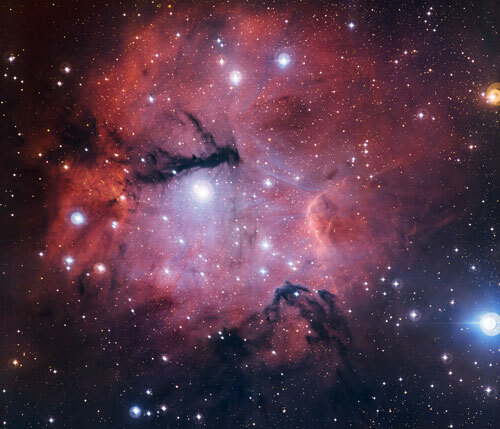 This image was taken as part of the ESO Cosmic Gems programme  using the Wide Field Imager on the MPG/ESO 2.2-metre telescope at the La Silla Observatory in Chile. It shows Gum 15, located in the constellation of Vela (The Sails), some 3000 light-years from Earth . This glowing cloud is a striking example of an HII region . Such clouds form some of the most spectacular astronomical objects we can see; for example the Eagle Nebula (which includes the feature nicknamed “The Pillars of Creation”), the great Orion Nebula, and this less famous example, Gum 15. The ESO Cosmic Gems programme is an initiative to produce images of interesting, intriguing or visually attractive objects using ESO telescopes, for the purposes of education and public outreach. The programme makes use of telescope time that cannot be used for science observations. All data collected may also be suitable for scientific purposes, and are made available to astronomers through ESO’s science archive. The name of this object comes from the Australian astronomer Colin Gum, who published a catalogue of HII regions in 1955. HII regions (pronounded “aitch-two”) are large clouds of gas and dust that are host to bursts of star formation and homes to infant stars.